Where Can Your Business Be Sued? If you do business, the risk of lawsuits is always present. If you’re sued in Florida, or around wherever you do business, it’s bad enough. But if you’re sued in another state, the cost and expense of defending yourself, as well as hiring attorneys you may not know or have any relationship with, can be risky and expensive. So where can you be sued? You can only be sued in states that you have what the law refers to as “minimum contacts.” The law asks whether it’s reasonable, foreseeable, and fair for you to anticipate being sued in a certain state. Generally, you can be sued anywhere that your company does business. That means that your company sells products or services to residents of that state. Furthermore, that means that your business has actually derived some profit from an actual business transaction or that you actively market your products or services in a certain state. What matters is who you do business with, not where your products end up. For example, you may sell furniture to a company that manufactures RVs in Michigan. Surely, you can be sued in Michigan. But just because an RV with your furniture in it may then, after sale, be driven to any state in the nation, doesn’t subject you to being sued in any state. Even if you were aware that the RV company sold RVs to people in Wisconsin, that awareness by itself wouldn’t subject your furniture company to being sued in Wisconsin. Marketing means you have to target a specific state – not simply make your service available to people in a state. Simply being listed online is not considered doing business in, or marketing in, another state, even though the internet is available to everybody. But if you purchased an ad with, for example, a Los Angeles newspaper’s website, that targeted advertising could be seen as consenting to jurisdiction in California. Courts will look to certain factors to see if your business has the required minimum contacts that will allow it to be sued in another state. 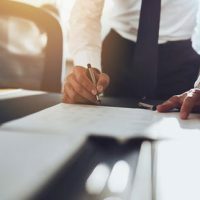 Businesses that have bank accounts, offices (even temporary ones), or employees or contractors in a state or which have paid any taxes to a state, may be subject to being sued there. Having control over another business in another state can subject you to jurisdiction there. In other words, partnerships, subsidiaries, or other companies that your business owns, directs or controls, will be considered the same as your business for the purpose of jurisdiction. Setting up a “separate company” that’s “not you” in another state to try to avoid your company from being sued there is not an effective strategy. What is more effective is a contractual provision limiting jurisdiction. If your business has agreements with customers in writing, clauses that say that you can only be sued in a certain state or county, are generally enforceable, if the person or company who signed the contract with you tries to sue you. Make sure your business isn’t subject to liability and avoid costly lawsuits. Contact Tampa estate and business attorney David Toback to discuss reviewing your business’ documents.